A rift between Australian Prime Minister John Howard and his powerful deputy was torn open Thursday with comments by the longtime leader's heir strongly criticizing his superior's early economic record. The remarks in a new biography of Howard, excerpts of which were published in a newspaper Thursday, come at particularly bad time for the government as it trails in opinion polls with elections looming. "The Howard treasurership was not a success in terms of interest rates and inflation," Treasurer Peter Costello told the biography's authors in late 2006. "He had not been a great reformer." 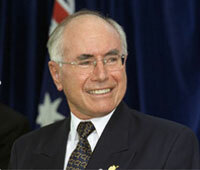 Costello's criticism was directed at Howard's stint as treasurer 20 years ago, but was uncharacteristically blunt for a political leader's deputy. Howard and Costello have had tense relations for years. The spat has echoes of the rivalry between former British leader Tony Blair and his No. 2 Gordon Brown. That rivalry only ended when Blair retired and handed power to the former finance minister last month. Howard last year denied making a deal with Costello to hand over power after a certain period - a bargain Costello supporters say the leader has reneged on. Costello has made no secret of his desire for the top job. The tensions have increased as the government's stocks in opinion polls have plummeted since Kevin Rudd was installed as the opposition Labor leader last December. Analysts say part of 49-year-old Rudd's appeal is his youth compared to Howard, 68 next week, and who the opposition had tried to portray as old-school and out of touch with issues such as climate change and Internet broadband. Costello, 49, has shepherded an unprecedented period of economic growth in Australia as treasurer since Howard's government first came to power in 1996, though polls show he is viewed as cold and calculating. The elections due this year could have a major impact on Australia's foreign policy, with Rudd vowing to set a timetable to bring Australian troops home from Iraq if he comes to power. Howard is among U.S. President George W. Bush's closest allies in Iraq and the fight on terrorism. The biography, "John Winston Howard: The Biography" by academics Peter van Onselen and Wayne Errington, is due to be published next week. Excerpts were printed Thursday in The Sydney Morning Herald. Among the examples of frosty relations, the book says Howard has never invited Costello and his wife to dinner at either of his officials residences - a courtesy given to many other officials. Costello, speaking on Australian Broadcasting Corp. radio, refused to confirm that aspect. "Where I dine with my wife is a matter for me," he said. "It doesn't worry me. I'm just as happy eating fish and chips on a beach." Costello said Thursday he did not believe the book would damage the government's chances at the elections. Howard also downplayed the rift, saying he and Costello had a close professional relationship. "It is impossible if you don't have harmony between a prime minister and a treasurer for the economy to be properly managed," he told reporters.